Mobile Photography Awards Seventh Annual Awards – Results! We’re delighted to reveal that the Mobile Photography Awards (MPA) 2017 Results have now been announced. As always we (I speak as a member of the Jury) were succumbed by the wealth of talent displayed across our screens. We’ve had more entries to this competition than ever before and the quality of submissions has been totally outstanding across all the categories. Personally, it was an honour for me to be asked to be a key member of this jury for the 7th consecutive year by founder of the Mobile Photography Awards, Daniel Berman and also to serve with James Bacchi, Anette Schutz, Giles Clarke, Evgeny Tchebotarev, Brendan O Se, Susannah Perlman, Jen Pollack Bianco, Sheldon Serkin, Andy Butler and Alon Goldsmith. I have listed every first prize winner, with their winning image as well as each and every runner up for all sections of this competition below. Huge congratulations to you all! Joao Batista Sousa, Kamil Konrad Kawczynski, Luis Rodri­guez, Mary Ellen Scherl, Laurence Bouchard, Dariusz Sobiecki, Agnieszka Domanska, Nicolas Xanthos, Joshua Sarinana, Dixon Hamby, Eric Mueller, Andrew B. White, Wang Hsiu Ling, Mar Lombrando, Kerstin Klinner, Manuela Matos Monteiro, Gabriela Stoczynska-Tuncdemir, Valeria Cammareri, Nan Deng, Mark Fearnley, David Welsh, Cara Gallardo Weil, Pierre Hauser, Jason Greene, Joseph Cyr, Glenn Homann, Rad Drew, Jedrzej Franek, Douwe Dijkstra, Jacob Izenberg, Zarni Myo Win, Leandro Selister, Arkadiusz Durczewski, Laurence Bouchard, Lisabeth Armstrong, Andrey Loptev, Dina Alfasi, Shelia McKinney, Anthony Ginns, Helen Breznik, Lee Atwell, Nick Riley, Antonio Andritch, Hu Shikang, Biao Peng, Douwe Dijkstra, Pai Hsiao, Jaime Walfisch, Lloyd Fox, Michel Juvet, Michel Juvet, Anders Bakken, Bartosz Parzyszek, Liz Anderson, Helen Breznik, Deborah McMillion, Deena Berton, Rebecca Bruyn, Roxanne Hardegree, Jane Schultz, Lorenka Campos, Jacob Dix, Trevor Messersmith, Tania Konnerth, Christine Sobczak, Yanan Cheng, Marian Rubin, Tommy Vohs, Christy Johnson, Catherine Caddigan, Tuba Korhan, Eleni Gemeni, Linda Hollier, Robin Robertis, Jill Booker, Jill Hamilton, Zarni Myo Win, Ag Ya, Xinyu Cui, Joshua Levine, David DeNagel, Dave Webb, Anthony Ginns, Ilise Harris, Neha Wadekar, Alexander Imas, Elisa Davis, Annette Widitz, Joson JoSon, Anna Ligia Souza Machado, Ed Wu, Yongmei Wang, Margarita Iskandarova, Po Wen Chang, Maria Berry, Michael Dunker, Boyuan Zhang, Rob Pearson-Wright, Juliet Cope, Aaron Sandberg, Cielo De la Paz, Nan Deng, Jill Goldman, Suzanne Engelberg, Mariko Klug, Julio Lucas, David DeNagel, Tommy Wallace, Alexanna Alvarado, Nicolas Xanthos, Henry Hu, Kaare Gade, Andreas J. Stone, James Abbott, Rebecca Bruyn, Helen Suk, Yi Hu, Guo Yi Huang, LinJuan Qu, Alap Parikh, Julio Lucas, Yongmei Wang, Star Greathouse, Andrea Rees, Dominika Koszowska, Natalya Peshkova, Yongmei Wang, Jarek Bryla, Jessica Dyer, Lynne Daley, Julie Hollow, Derrick Mims, Jose Manuel Barcia, Moira Callegari, Frederic Deschenes, Wang Hsiu Ling, Alex Walker, Bobbi McMurry, Kerstin Klinner, Fleur Schim, Sue Maynard, Sue Maynard, Melissa Smith, Blue Lizard, Piroska Boros, Melissa Lynch, Yongmei Wang, James Peck, Geoff Cunningham, Judd Duclos, Claudine Watanabe, Waldemar Nowak, Katie Frisbie, Rodrigo Vieira, Yip Jia Chang, Kaare Gade, Blair Lucas, Mikhail Bochkarev, Guo Yi Huang, Sarah Wade, Abby Morris, Rosie Karel, Jennifer Boyland, Joseph Finley, Hansa Tangmanpoowadol, Yongmei Wang, Eugene Ng, Teemu Laulajainen, Aisha Anjum, Marcel Schneider, Bertie Garnett, Po Wen Chang, Jerome Dulong, Sylwia Mej, John O’Neill, Scott Shreve, Leo Banks, Rafal Dybacki, Robbie Crick, Alfonso de Cruz Barrios, Jennifer Thomas, Sukru Mehmet Omur, Cielo de la Paz, Yongmei Wang, Magdalena De Jonge Malucha, Shinnya Umetsu, Elaine Taylor, Catherine Palmeiro, Moira Callegari, Louis Mondot, Mar Lombrando, Hlaing Myint Min, Henry Hu, Blue Lizard, Jose Luis Barcia Fernandez, Michael Dunker, Neha Wadekar, Mihai Popescu, Federico Borobio, Cindy Patrick, Samuel Nacar, Anna Kaunis, Daphne Tolis, David Turnbull, Patrick Ryan, Gary Horsfall, Ag Ya, Zarni Myo Win, Zorica Purlija, Luis Rodriguez, Laurence Bouchard, Vladka Kocvarova, Cindy Buske, Geoff Cunningham, Donna Eck, Rodrigo Vieira, John Nieto, Damian Kostka, Majella Burrows, Ge Zeng, Neha Wadekar, Jason Greene, Hlaing Myint Min, Ed Wu, Denys Trofimchuk, Michael Trombino, Juliet Cope, Dominika Koszowska, Antonia Andritch, Arpita Upadhyaya, Jeong Vin Yoon, Patricia Lopez-Hurtado, Tee Lip Lim, Arik Chan, Anthony Ginns, Nick Riley, Leland Bobbe, Lloyd Fox, Antonia Andritch, Zarni Myo Win, Arpita Upadhyaya, Valdemir Cunha, Yongmei Wang, Pai Hsiao, Po Wen Chang, Lidia Garofeanu, Lloyd Fox, Roy Pan, Katarzyna Matukiewicz, Rodrigo Rivas, Bartosz Parzyszek, Cielo de la Paz, Dominika Koszowska, Paola Ismene, Olga Virich, Eliza Badoiu, Alessandro Comandini, Eric Mueller, Heather McAlister, Olympia Montaldo, Paola Ismene, Christy Johnson, Mengting Tang, Sui Sawada, Zhonglai Zhang, Ileana Montano, Angie Lambert, Boyuan Zhang, Po-Yi Li, Glenn Homann, Rodrigo Rivas, Cecilia S. Thiago, Laurence Bouchard, Mariusz Majewski, Douwe Dijkstra, Kathy Clay, Arpita Upadhyaya, Erik Lieber, Neha Wadekar, Louis Mondot, LinJuan Qu, Vince Keresnyei, Vadims Timoskins, Antonia Andritch, Olesia Kim, Ed Wu, Jose Luis Barcia Fernandez, Juliet Cope, Andreas J. Stone, Daphne Tolis, Sesh kumar Sareday, Song Han, Meg Greene Malvasi, April Bloome, Andrew Lucchesi, Po Wen Chang, Eleni Gemeni, Cara Gallardo Weil, Jessica Dyer, Sandi Pfeifer, Sasa Prizmic, Vu Bui, Julie Hollow, Magdalena Pierwocha, Sukru Mehmet Omur, Alexis Rotella, Barbara Nebel, Rodrigo Rivas, Andrea O’Reilly, Antonia Andritch, Geoff Cunningham, Leandro Selister, Jacob Dix, Simon Groves, Colin Cornwall, Anthony Ginns, Trevor Messersmith, Valdemir Cunha, David Fidalgo, Kevin Moore, Margarita Iskandarova, Mark Fearnley, KSeven L, Marc Zetterbom, Patrick Ryan, Arpita Upadhyaya, John O’Neill, Kaare Gade, William Praniski, Maria Ukhabina, Yi Hu, Sugimon Widodo, Andrey Ostapenko, Donna Eck, Claire Doyle, Simona Bonanno, Alexander Genkin, Jacob Dix, Glenn Homann, Karen Izenberg, Zarni Myo Win, Tanveer Hassan, Tina Schwermer, Yanan Cheng, Kat Clay, Henry Yu, William Praniski, Magdalena Pierwocha, Guo Yi Huang, Lucille Kanzawa, William Shum, Hlaing Myint Min, Amanda Mideros, Annette Widitz, Dominika Koszowska, Jose Luis Barcia Fernandez, Rogova Asya, Megan Davis, Ed Wu, Swee Hoe Lim, Yongmei Wang, Eugene Ng, Julia Nathanson, Anders Bakken, Simon Groves, Nikki Pinkham, Erin Mcgean Cindric, Arnold Gonzalez, Jen Mckenzie, Jana Curcio, Robin Cohen, Rosie Karel, Amy Ecenbarger, Kate Zari Roberts, Ali Tariq, Allison Pistohl, Patricia Januszkiewicz, Sandi Pfeifer, KSeven L, Jill Booker, Claire Doyle, Gabriela Stoczynska-Tuncdemir, Paola Ismene, Waldemar Nowak, Arrin Chapman, Valeria Kirejenko, Kaare Gade, James Abbott, Hlaing Myint Min, Annette Widitz, Kerstin Klinner, Mikhail Bochkarev, Guo Yi Huang, Kevin vonKluck, Nick Riley, Lydia Fernandez-Arias, Jennifer Boyland, Donna Eck, Richard Vine, Skylar Kim, Tan KH Victor, Po Wen Chang, Wind Tay, Mauricio Lanza, Irene Oleksiuk, Andrew Love, Jill Booker. 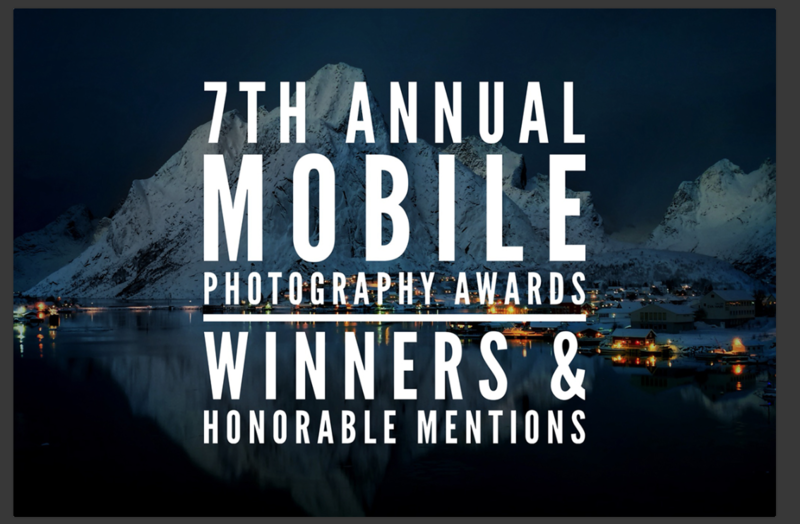 Read moreMobile Photography Awards Seventh Annual Awards – Results! Mobile Photography Awards Sixth Annual Awards – Results! We’re delighted to reveal that the Mobile Photography Awards (MPA) 2016 Results have now been announced. As always we (I speak as a member of the Jury) were succumbed by the wealth of talent displayed across our screens. We’ve had more entries to this competition than ever before and the quality of submissions has been totally outstanding across all the categories. Personally, it was an honour for me to be asked to be a key member of this jury for the 5th consecutive year by founder of the Mobile Photography Awards, Daniel Berman and also to serve with James Bacchi, Annette Schutz, Evgeny Tchebotarev, Jen Pollack Bianco, Brendan O Se, Susannah Perlman, Stefano Fantoni, Sheldon Serkin, Andy Butler and Christopher Wahl. Many congratulations to all the 2016 MPA category winners and honourable mentions and of course, a special shout out to the grand prize winner Giles Clarke. A professional photo journalist, born in London in 1965, he began taking pictures seriously in Berlin in the mid 1980’s. In 1995, he moved to New York City where he began an intense year in the Richard Avedon studio. A decade long career producing television for Channel 4 UK in Hollywood was to follow. In more recent times, Giles began the serious work & dedication of activism starting with a 6-week stint in Bhopal, India where he filmed & photographed the victims of the Union Carbide gas tragedy that still continues to haunt the inhabitants of that city. He scoops the grand prize money of $3,000. Congratulations to all, including Jennifer Thomas, Pedro Ribeiro, Yasuhito Shigaki, Mariusz Majewski, Jian Wang, Laurence Bouchard, Phillipa Frederiksen, Jessica Dyer, Joshua Sarinana, Tee Lip Lim, Michael Kistler, Sheila McKinney, Liza Cobangbang, Andrew Hays, Anthony Ginns, Elaine Taylor, Eric Mueller, Cara Gallardo Weil, Alexander Genkin, Charles Needle, Sena Cakiroglu. Anders Bakken, Junfeng Wang, Douwe Dijkstra, Froilan Fabella, Joanne Givogue, Agustin Colla, Bartosz Parzyszek, Jose-Luis Saez, Laurence Bouchard, David DeNagel, Emmanuel Etti, Richard Chambury, Lavinia Yang, David Ingraham. Anthony Ginns, Lukasz Gurbiel, Saskia Howard, Yu Jiang, Davide Capponi, Christian Steiauf, Agustin Colla, Lukasz Zietara, Kelleen Macklin, Dixon Hamby, Jacob Dix, Emmanuel Etti, Joshua Sarinana, Andy Royston, Christian Mondot, Cathrine Halsor, Douwe Dijkstra, Sharon Jones, Erik Lieber, John Nieto, Susan Liang, Christopher Swink, Christine O’Brien, Nico Brons, KSeven L, Stefanie LePape, Bobbi McMurry, Helen Breznik, Erin McGean Cindric, Jacob Dix, Lorenka Campos, Jane Schultz, Nicolas Xanthos, Lucina Nicholas, Eliza Badoiu, Juta Jazz, Cindy Buske, Vladka Kocvarova, Katie Teixeira, Deena Berton, Deborah McMillion, Sukru Mehmet Omur, Linda Hollier, Andrew Schwartz, Charles Needle, Eleni Gemeni, Delight Worthyn, Mariko Klug, Karen Izenberg, Marcin Kosmowski, Katrina Stewart, Paddy Chao, Jessica Dyer, Maximilian Canepa, Sally Ann Field. Jian Wang, Richard Barron, Sam Burton, Nicole Vecchi, Lauren Treutler, Bartosz Parzyszek, Steve T, Suwandi Chandra, Jose PauloAndrade, Lee Potter, Anna Scrigni, Maria Duliban, Balbino Jimenez, Sean Hayes, Rodrigo Vieira, Jessica Powell, Grzegorz Tutaj, Blue Lizard, Joseph Cyr, Irene Oleksiuk, Kristina Ernst, Catriona Donagh, Elvio Santos, Kimberly Post, Jenneke Tesselaar, Geoff Cunningham, Nancy McClure, Alon Goldsmith, Vikram Deo, Du Castel Didier, atala Peshkova, Majella Burrows, Melissa Lynch, James Peck, John Pratt, Stanislav Duben, John Mills, Kejia Liu, Maria Duliban, Caroline E Brown, Kirsty Nadine, Anitra Lavanhar, Margarita Iskandarova, Edwin Luo, Maria Duliban, Ludwig Wagner, Yasha Spektor, Jonathan Nalder, Anne Highfield, Flaviana Boni, Pier Luigi Dodi, Mariko Klug, Silvio Rusmigo, Neil Wyn-Jones, Dr Cliff Oliver, Wes Calimer, Heline Lam, Jenny Rubin, Mallory Gottlieb, Shirley Drevich, Andrew B White, Boza Cucek, Michele Romani, Olga Strizhenova, Caroline E Brown, Claire Doyle, Roy Fochtman, Miro Calderon, Irene Oleksiuk, Jason Greene, Zarni Myo Win, Natalya Peshkova, Allyson Marie, John Pratt, Glenn Homann, Rob Pearson-Wright, Albion Harrison-Naish, Lee Atwell, Rodrigo Vieira, Catherine Halsor, Adria Ellis, Shinnya Umetsu, Coco Liu, Yasuhito Shigaki, Brett Gross, Ag Ya, Aung Pyae Soe, Zarni Myo Win, Jason Mills, Geoff Cunningham, Gabriel Luken, Junfeng Wang, Ushi Grant, Tim Bingham, Philip Am Guay, Manula Waidyanatha, Molly Porter, Lekon Vasilev, Jirasak Panpiansin, Nathan Ishar, Paddy Chao, Ocean Morisset, Jill Emmer, Tan KH Viktor, Yingting Shih, Cindy Patrick, David Turnbull, Andrea Rees, Michelle Robinson, Gabriel Luken, Santi Carneri, Qasim Albuesaa, Katarzyna Weremko, Edwin Luo, Paddy Chao, Elle Toussi, Zarni Myo Win, Dina Alfasi, Lukasz Gurbiel, Tommy Wallace, Ayako Miyamoto, George Kamelakis, Thomas W, Kristie Benoit, Deena Berton, Dutch Doscher, Hao Han Luo, Cecilia S Thaigo, Santi Carneri, Agustin Colla, Jason Greene, Aaron Sandberg, Luis Rodriguez, David Booker, Kayvan Tahaei, Lee Potter, Meredith Rilley, Gina Loncomilla, Alfonso de Cruz Barrios, Paddy Chao, Yiannos Zachariou, Richard Chambury, Junfeng Wang, Rodrigo Rivas, john Nieto, Song Han, Anthony Ginns, Rodrigo Vieira, Dariusz Sobiecki, Laurence Bouchard, Andrew Hays, Paula Broom, Belinda Curtis, Petyr Campos, Jose Luis Barcia Fernandez, Alon Goldsmith, Angie Lambert, Arik Chan, Ismael Acosta, Erik Lieber, Jirasak Panpiansin, Ahmad Zamroni, Manny Vargas, Alexander Genkin, Mirjam Klever, Helen Breznik, Dominika Koszowska, Chen Yuan Cheng, Po-Yi Li, Olga Strizhenova, Miao He, Tantiana Andri, Jessica Powell, Jacob Dix, Katie Teixeira, Suzanne Engelberg, John Nieto, Lee Atwell, Graeme Roy, Clay Benskin, Richard Chambury, Lloyd Go, Chen Liu, Paola Ismene, Albion Harrison-Naish, Sreeranj Sreedhar, Marcos Losada, Anderson Santana, Thomas Toft, Roy Fochtman, Claire Doyle, Pierre Hauser, Roxanne Hardegree, Agniezzka Domanska, Chiara Santoro, Meg Green Malvasi, Christina Loutfi, Marjella Burrows, Oleg Bolotnikov, Sally Ann Field, Patyrk Kuleta, Quang VB, Lukasz Zietara, Simone da Lima, Andrew Ngo, Christine o’Sobczsak, Trevor Messersmith, Jacob Dix, Balaji Sivaramakrishnan, Caroline E Brown, Brigitta Pinter, Istvan Hainer, Michel Juvet, Viktor Jecs, Andrew Ngo, Junfeng Wang, Geoff Cunningham, Lisabeth Armstrong, Scott Simpson, Halil Yalcin, Caren Drysdale, Benjamin Liu, Christian Mondot, Patricia Hirschfield, Glenn Homann, Katrina Stewart, Gretchen Grace, Dragos Bardac, Leonardo Eroico. Tricia Darling, Song Han, Sahar Rehman, Christabel Rose, Eleonore Simon, Junfeng Wang, Tara Todras Whitehill, Thigh Wanna, Anita Pallas, Anna Bernal, Maria Duliban, Silvio Rusmigo, Miro Calderon, Edwin Luo, Tommy Vohs, Makar Tereshin, Zarni Myo Win, Jian Wang, Dietmar Barns, Isidor Leontis, Joanne Givogue, Shinnya Umetsu, Ryan Cardone, Rosa Yip, Ludwig Wagner, Pierre Hauser, Kejia Liu, Philip Am Guay, Tarja Vilmi, Robin Robertis, Katarzyna Steblewics-Plak, Cielo de la Paz, Jeanette Serrat. Kseven L, Marian Rubin, Tuba Korhan, Ricardo Villanueva, Maciej Fuchs, Paul Pena, Ann Passmore, Frederic Mahy, Jill Booker, Amadeusz Jackiewicz, Sam Burton, Clay Benskin, Abeer Raafat, Dragos Bardac, John Gayusky, Magdalena De Jonge Malucha, Patryk Kuleta, Mark Fearnley, Maria Duliban, Francesco Mattucci, Luis Rodriguez, Yllka Fetahaj, Ben Shanson, Ushi Grant, Erik Lieber. Read moreMobile Photography Awards Sixth Annual Awards – Results!